The Gulf of Alaska (GOA) is a highly productive ecosystem and home to a number of diverse marine mammal species. Although cetaceans are present year-round, the greatest numbers occur between spring and fall, when migratory species such as humpback whales (Megaptera novaeangliae), blue whales (Balaenoptera musculus), and gray whales (Eschrichtius robustus) return to this area for foraging. During the era of historical whaling, many species of whales were heavily hunted in the GOA. Although today some species are recovering, such as fin whales (B. physalus) off western Alaska and the central Aleutian Islands (Zerbini et al. 2006) and humpback whales throughout the North Pacific (Barlow et al. 2011), not all share a similar success. North Pacific right whales (Eubalaena japonica), for example, were nearly decimated by illegal Russian whaling during the 1960s (Ivashchenko and Clapham 2012) and are only sighted on rare occasions today (Wade et al. 2011). Although blue whales are regularly sighted in concentrations off the west coast (Calambokidis and Barlow 2004), sightings within the GOA remain infrequent (Calambokidis et al. 2009). The GOA is also home to three known species of beaked whales, Baird’s (Berardius bairdii), Cuvier’s (Ziphius cavirostris), and Stejneger’s (Mesoplodon stejnegeri). Beaked whales are some of the most poorly understood of cetaceans with only limited sightings within the GOA. They spend a majority of their time subsurface, regularly diving to depths of hundreds to thousands of meters. They often occur in small groups and can behave inconspicuously at the surface. These factors make them difficult to detect and study using visual survey methods alone. Figure 1. The Navy Temporary Maritime Activities Area (TMAA) with survey strata and tracklines for the GOALS II research cruise. The Navy periodically uses a Temporary Maritime Activities Area (TMAA; 144,560 km2) in the central GOA, east of Kodiak Island (Fig. 1), for training purposes. The TMAA encompasses diverse habitat consisting of the continental shelf, slope, and offshore pelagic waters with numerous seamounts in the offshore region. In order for the Navy to conduct exercises within the TMAA, analyses of the potential impacts on biological and environmental resources are required. 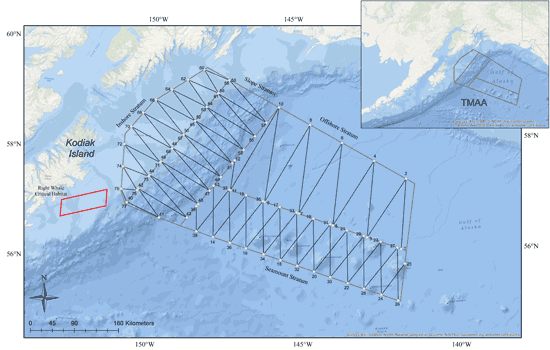 In 2009, the Navy funded a line-transect survey (Gulf of Alaska Line-Transect Survey, GOALS) that provided density and abundance estimates for fin whales and humpback whales, as well as limited distribution information for several other species (Rone et al. 2010). The survey was successful in gathering important data on the cetaceans present in this largely unexplored area. However, additional data on species’ densities in regional areas was necessary for the Navy to meet their environmental stewardship obligations. In the summer of 2013, the Navy funded an additional survey (GOALS II) to fill knowledge gaps on the distribution, movements, and densities of marine mammals within the TMAA.